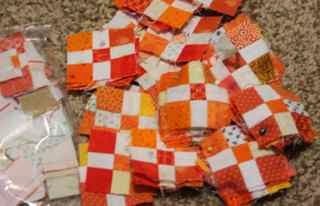 As we move from September to October, our scraps will be moving from orange into brown and maybe even black. October has been reserved for the darker shades of the scrap bin. I know a lot of people like to push these shadowy hues to the side and ignore them in favor of the bright and happy colors, but I urge you to dig in and see what you can find to play with this month. 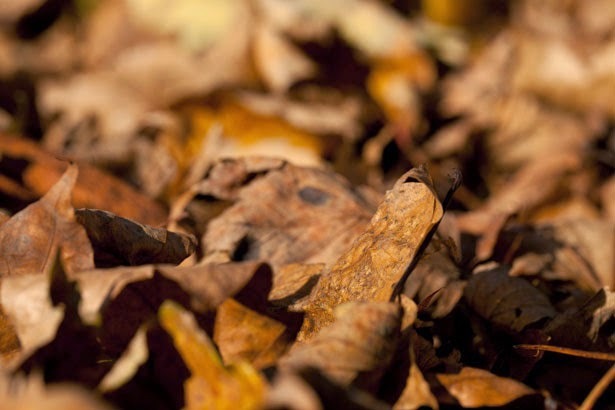 Any shade of brown, black or even gray will work for this month. It is the last orange Saturday. I've enjoyed seeing all the fall colors coming out this month. A lot of block collections seem to be coming together right about now, which is good timing as the end of the year starts to peek its head around the corner. Starting to see all the different colors come together is all part of the fun of the end of year. 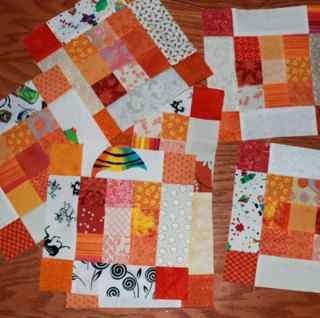 Last weekend I spent a good bit of time putting together baby nine patches with churn dash blocks. These little guys have been brewing for quite a while, so seeing them turn into a quilt will be enjoyable. Speaking of things that are enjoyable. It is time to start taking names for the giveaway of Vicki Welsh's hand dyed fabric for the new month. 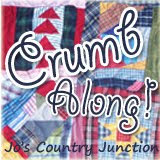 To enter the drawing, just leave a comment on this post with the number one quilt on your "someday" list. Sewing on a School Night! I used my sewing machine. On a school night! 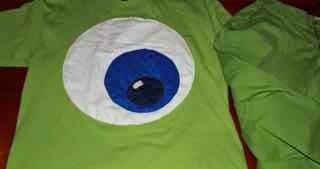 This week is "spirit week" at school with a different theme each day for costumes and festivities. Tomorrow's is "dynamic duos". Guess who I am? Now that I've had more than my fair share of fun, I'd better do a bit of work for school. I was supposed to catch up on grading yesterday night, but fell asleep on the couch at 8 instead. Oops. I'll do better tonight. Already 8:30 and I'm going strong. Its been a long week and I am so glad to have made it to the weekend! My husband was in Japan most of the week and being a single mom is HARD! I'll be so happy to have help with the carpooling this weekend. I like having him around for other reasons too, but carpooling is pretty high on the list. I am hoping to find some time to turn these itty bitty nine patches into slightly bigger nine patches toady and maybe even make some churn dash blocks to alternate. What are your scrappy plans for the day? Use mister linky below to share your progress. 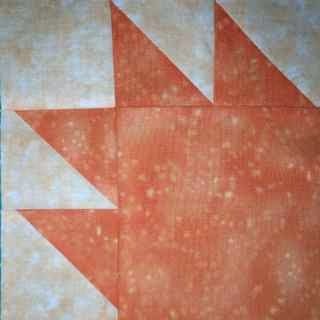 I saw this cute block on Pinterest linked to someone's flicker page. It was called "cute block". Really? I think it looks like woven ribbons. It is just a slight modification of four patches really, but put together with clever color combinations. 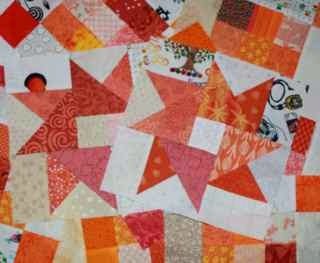 Choose 4 different shades or patterns of orange. I chose almost solids. For the contrasting corners I used yellow. You could also use a light orange or neutral background shade. 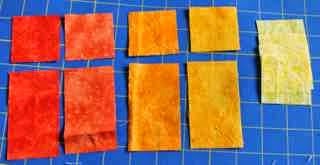 For each of your four oranges, cut one square that is 2 x 2 and one rectangle that is 2 by 3.5 inches. 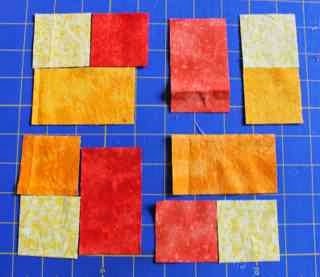 From your yellow or background fabric, cut 4 squares, each 2 x 2. 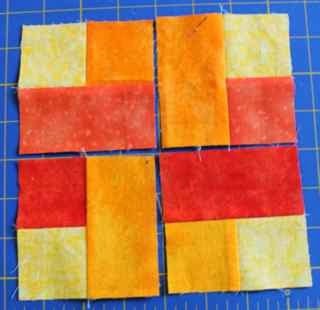 Start by sewing each orange square into a two patch with a yellow square. There is really no way to mess this part up, so don't worry about color arrangement quite yet. Now is the time to fuss over color placement. Each shade of orange goes on the same horizontal or vertical plane, interrupted by a different rectangle running on the perpendicular plane. The yellow squares form the four outer corners of the block. 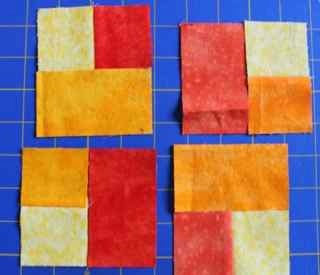 Sew each two patch to an orange rectangle to make your modified four patch unit. Now lay everything out and make sure you have the color placement just right. 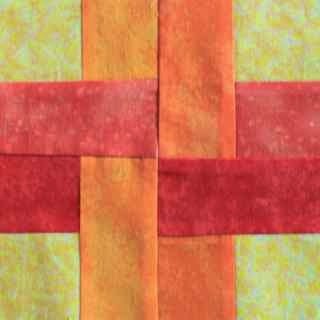 Notice that the dark and medium oranges both form straight horizontal lines interrupted by the light oranges which are both running vertically, but "woven" in where they cross in the center of the block. Make sure your background squares stay in the outer corners. 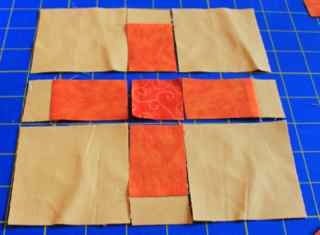 Now sew your four patches together to get your final block. Really a simple one to put together if you can just get your colors placed properly. It only took me three tries. Hope you get right your first time! ScrapHappy Saturday - Orange you Glad its Fall? I made these two orange stars last Sunday. That was the last time I sat at the sewing machine. Work has been keeping me busy these days, and with my other chauffeur out of town, I've spent time with my foot on the gas pedal instead of the sewing machine pedal. He's home again now though, and I am sure he won't object to some sewing time before the cycle starts again. The kids will be running around for the most part, so other than needing rides to practices, games and parties, we are somewhat unnecessary. I am really enjoying orange! Aren't these Mai Tai Stars happy? They have partial seams which takes a bit of concentration, but I am going to love them in the finished quilt. All of the split HST blocks are done, they just need to be put together. How are your oranges coming along? Use the linky to share your progress so that we can all come and enjoy. This is a simple variation of a nine patch. It seems "modern" to me. 1 - 1.5 inch square. 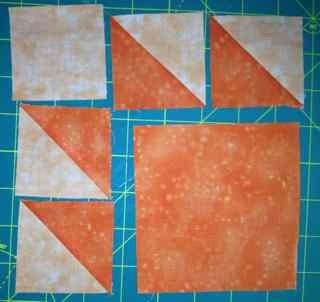 Take one small rectangle of background orange and sew it to one end of each dark orange rectangle. Press toward the dark fabric. From this point you are just sewing a nine patch. 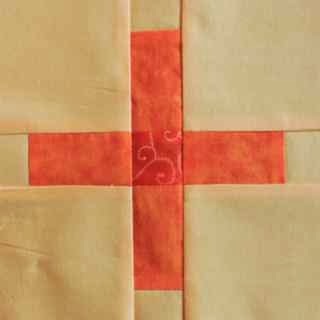 The large orange background squares form the four corners and the center square is the small contrasting orange square. Make sure the background goes away from the center. There it is, nice and simple. There is something about orange that just makes me smile. I really didn't have much for the first few years of the Rainbow Scrap Challenge, but now I've collected quite a nice little bunch. Last weekend I used some of them to make framed nine patches to go with Mai Tai, today I will work on some of the star blocks that alternate. 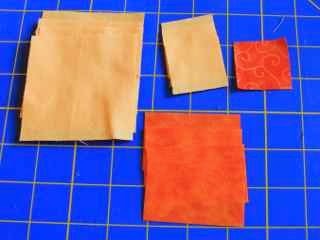 The hand dyed fabric by Vicki Welsh for this month goes to a fairly new blogger at Needle and Foot. Vicki is having a sale right now, so if you weren't the lucky winner this time, please be sure to check it out. How about you? Use misterlinky to share your own orange plans and projects. I saw this one over at the Academic Quilter and just had to rush off and make one. It uses the tri-recs ruler. Once you have a ruler, it is nice to be able to use it in lots of different ways. Usually it makes the pointy stars, I've also seen it used for Alamo stars, and this pinwheel version makes three uses for the same ruler. 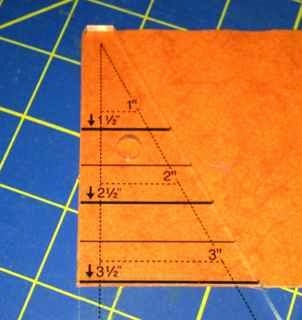 The middle of the block is made with this fat part of the ruler. You will need 4. 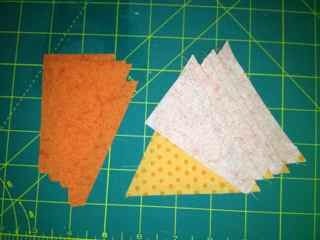 It is easiest if you double your fabric over and cut two units at a time. This part of the ruler combo makes the wing portion of the block. 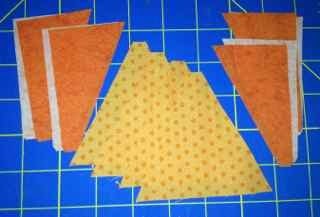 With fabric doubled over you will cut 4 pairs. 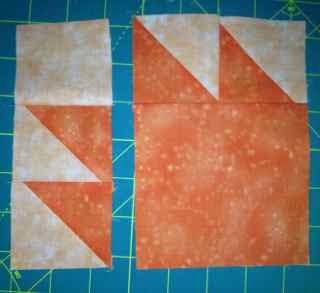 Make sure the fabric is wrong sides together or right sides together so that your pairs will be mirror imaged. This is how the wings get lined up. The wide part of the wing goes toward the apex of the base piece. Finger press the seams open and add the other wing. Press with the seams going toward the dark and trim the dog ears. This is the block layout. Notice the direction of the top of the block, it faces in a different direction for each section. Sew the four subunits together and enjoy. Ah, the joy of three day weekend! So much time to play with fabric. There were PLENTY of nine patches ready to work into Mai Tai, but as I was power lifting yesterday, I was pondering different layouts. 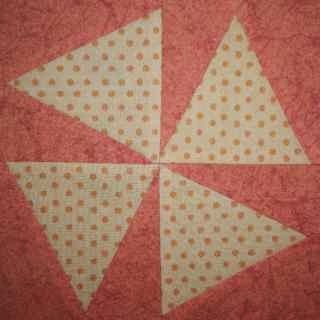 I am thinking of turning it into Mai Tai Sunrise with a horizontal color pattern rather than the diagonal stripes I've been working on sashing out the nine patches, but haven't gotten too many of the star blocks done quite yet. I kind of like the open white space the sashing on the nine patches create around the stars, though it will dilute the colors. The sunrise is over water of course, fading into some green grass along the bottom. Yellow will rim the horizon, fading into yellow, pink and finally red along the top. Honestly, it is more of a sunset than a sunrise, but then the irony of Mai Tai and Tequila Sunrise both being tropical drinks is lost. I've got a bit of school work to do first, but maybe after that I can add a few more blocks to the collection. The bears paw block is generally found in groups of 4 with a center sashing. I wanted something a little simpler and so worked up a single paw. I used a dark and a light orange. 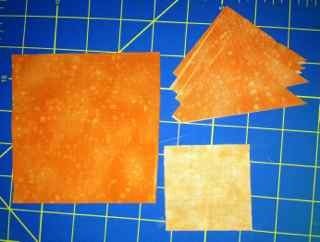 Start with a large 4.5 inch square of orange. Next get a strip of light and dark that are each 2.5 inches wide. 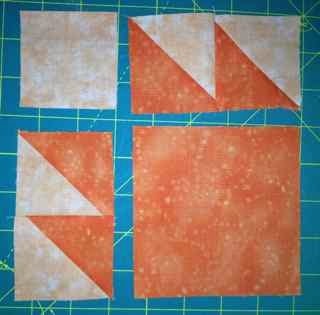 Pair them right sides together and use the easy angle ruler to cut 4 HST blocks. 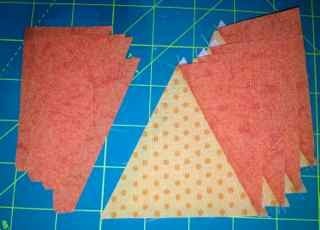 Sew the HST units together, trim the dog ears and press toward the dark fabric. Arrange them on two sides of the large orange square so that the dark edge faces up and toward the large square on the left and down toward the large square on the top. Check your placement against the picture to make sure the toes are all pointed the right way. The light square will fill in the empty corner. 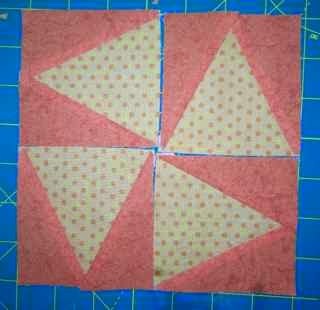 Sew both pairs of HST units together and press toward the dark fabric being careful to let the points lie flat. 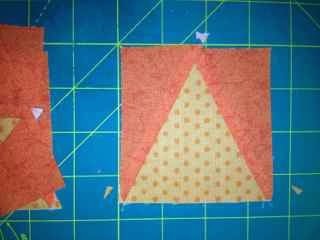 Sew one set of toes to the top of the block. 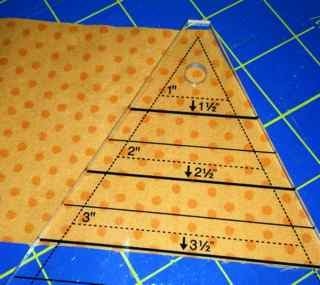 Sew the light square to the top of the other. Press toward the plain square in both cases. Sew the side toes on and press toward the large square. Your block should be 6.5 inches unfinished. I started this Mai Tai quilt many moons ago as part of the Rainbow Scrap Challenge. I has seen it originally as part of a post about a Bonnie Hunter cruise . I didn't have enough information yet to put it all together, until I saw this post in Quiltmaker magazine. Since then I've been making nine patches as leaders and enders to go along with the color of the month. Just a few each month, but they have added up over the last couple of years. 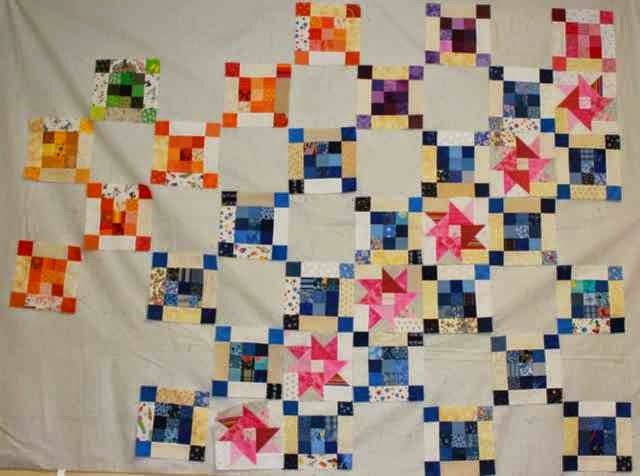 There are even a few pink star blocks to give you the idea of how it will look when it starts to come together. It is a school holiday today! That means I have extra sewing time to enjoy. First I think I'll get some more of the nine patches sashed, and then I might even work on some stars. I think I'll do a general diagonal color rainbow, but offset the stars and nine patches by one color to give it a more blendy effect. 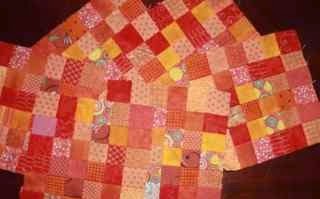 I'm going to join in at Patchwork Times this week for design wall Monday in celebration of labor day. I was tagged last week by Andee to post as part of the Around the World Blog Hop. Given the status of the holiday weekend and the general business of everyone's lives, I chose to ask for volunteers to tag. These three lovely quilters were kind enough to step forward. So please go and check them out. 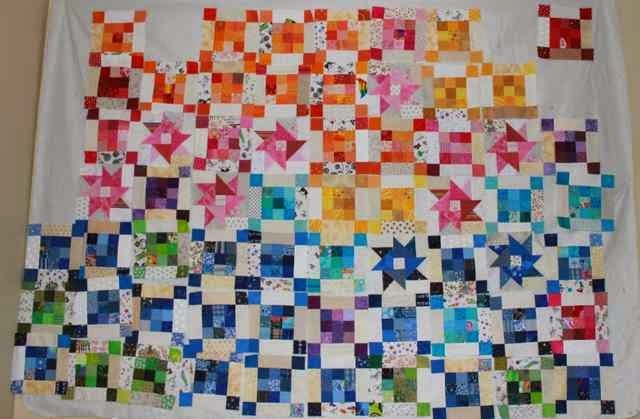 High Road Quilter - Shasta is an eclectic quilter. Her work defies easy categorization and she isn't afraid to try new styles. 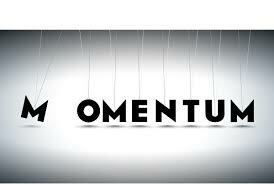 She also weaves and writes articles for HubPages. The Academic Quilter - Mari a college professor as well as a quilter. Her bright and happy colors make my heart sing. 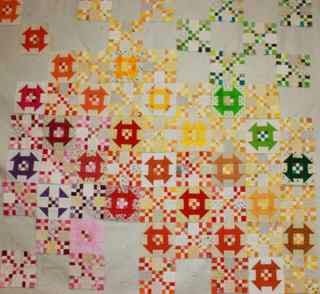 Zana Ninis - Katie Z. is a wife and mother as well as a quilter. She also finds time to join in to the rainbow scrap challenge, though I don't know how with all she has going on.